For many potential online casino players, the biggest reason for not gambling on their favorite casino games on the internet is simply distrusting the integrity of the software. Even though the reputable online casinos have their RNG’s audited and certified by a third party company, no one really understands this process or can verify it. In the end, these are just claims. To garner the trust of these skeptics, the top online casinos have launched Live Dealer casino games, which utilize real, live dealers or croupiers conducting the live action, which is brought to you via live video streaming! The live dealer casinos are flourishing and gaining popularity among online gamers. Watch this introductory video about live dealer casinos below. Gambling online has never been more fun. Because of technological advancements in internet throughput, safety, and video streaming, the best games include live dealers hosting games with all the action streaming to you in real-time! The leading online casinos now deliver live dealer casino games, where you can gamble online and view the action unfold live via video streaming. Live blackjack, roulette, and baccarat are the most popular games. You can even chat online with the dealers and other customers. All of the leading industry casino brands have adopted live dealer capabilities, some creating the technology themselves, and others licensing the technology from software companies such as Evolution Gaming, EntwineTech, and Playtech Software. Common features include a variety of stakes, adjustable viewing modes, audio for hearing the real sounds of the game, an online chat box to communicate with both the dealers and the other players at your table, plus hot female dealers! With multiple tables offering various stakes and 24 hour availability, live dealer games can provide you a new and exciting form of excitement, at any time, right form the comfort of your home! Some of the more unique capabilities include a full screen video mode, your choice of Asian or European dealers, and private high-stakes VIP tables. When playing live blackjack, you can see the actual cards dealt in front of you with over-sized playing cards. When playing live roulette, you will be able to watch the ball bounce around the wheel. The experience of a live dealer and video streaming is an awesome new way to experience your favorite online casino games. It doesn’t get any more exciting, and you’ll feel like you are sitting at a gaming table in Las Vegas… except you can play from the comfort of your couch, while watching tv, enjoying a drink, and in your pajamas! Find additional reviews of the leading online live casino sites at LiveDealerSites.com. 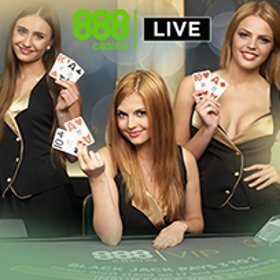 Redeem this 888 live casino promo code for a £30 bonus!